I remember the first time I spotted a Wheres George dollar bill, which is part of the Currency Tracking Project. 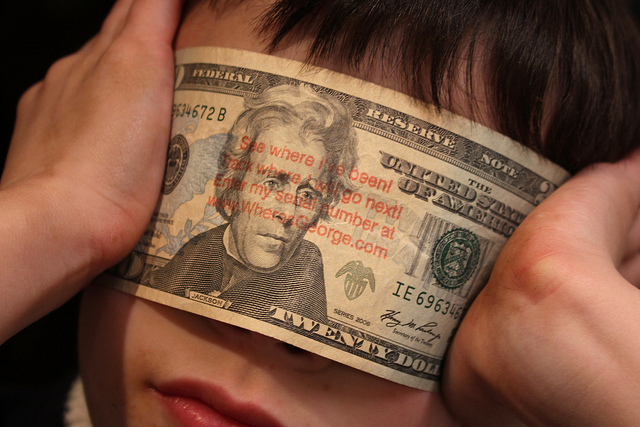 It was back on August 2, 2008 when I spotted the dollar bill marked with “track this bill at www.wheresgeorge.com”. At the time, I was puzzled — and intrigued. As you’d guess, I brought the dollar bill home, looked up www.wheresgeorge.com, and typed in the dollar bill’s serial number as well as my zip code. What I learned next about my dollar bill was amazing! So, where exactly had my dollar bill traveled before arriving in my wallet in Central Florida? The dollar bill was first tagged in Massapequa, New York, on October 17, 2007. It was next sighted in King’s Park, New York, on July 6, 2008 — 9 months later and 18 miles away from the dollar bill’s last entry in the Wheres George system. On July 30, 2008, the bill wound up in Tampa, Florida — so it took a trip of about 1,030 miles in 24 days. My wallet was the next stop that dollar bill made in Tampa, on August 2, 2008. So, what can I conclude from the Wheres George study? That my dollar bill (a “B” series bill) was released from the Federal Reserve bank in New York City, probably distributed to a bank in Massapequa, sat in someone’s home for a good while before being spent, and then wound up taking a trip south either along Interstate 95 or by plane before arriving in my wallet. There’s a human side to this dollar bill’s story. Whose pocket did my dollar bill travel in? A New York City Broadway star? A family of happy travelers riding in their minivan down south along Interstate-95? Maybe a retired couple from New York moved down here from the Big Apple region and brought the bill to me? There was somebody else in Tampa who had this bill before I did. Who is he or she? A friend or neighbor? A classmate? What did this bill buy? Maybe a cup of coffee? A lottery ticket? Of course, I don’t really know the story my dollar bill would say if it could talk, but it certainly is fun taking the info about the places my money has been and making a story up! Have you found a dollar bill marked with the words Wheres George or Currency Tracking Project? It’s really easy to enter your dollar bill into the Wheres George system. Enter the bill’s 10- or 11-digit serial number. Tell Wheres George whether or not you have the dollar bill at the time of entry. Once the system accepts your entry, you will be prompted to enter other information about the dollar bill — such as its condition, where you found it, and other details. If you would like to submit a dollar bill for registration to Wheres George, you must first be a registered user of the site. There are rules for stamping dollar bills, and any bills that are marked with a wheres george stamp must be spent in the natural course of circulation. In other words, if you want to get a new dollar bill at your local bank, mark it with wheresgeorge.com, and then spend it on a coffee at McDonalds — that’s perfect. You can’t however, stamp dozens of bills and then spend them all at one retailer or deposit them all at the bank. That isn’t a fair way to use wheresgeorge.com because it doesn’t allow users to really track money and see what our currency’s normal travel patterns look like. Wheres George is a fun tool for tracking your money and seeing where it goes — let’s all play fairly so the currency tracking project can be enjoyed by everyone! There have been a lot of changes to our nation’s paper (actually, cotton) currency in recent years. There are plenty of people who even want to eliminate the $1 bill and replace it with a $1 coin. #1 – So what’s up with the dollar bill and why might it be eliminated? Turns out that the average piece of paper currency lasts only about 18 months in circulation, whereas a coin typically lasts 30 years. It costs about 5.4 cents to make a dollar bill and about 12 cents to strike a dollar coin, but some claim the savings over the course of 30 years could amount to $4.4 billion. #2 – Have you ever noticed any of the symbols on dollar bills that convey secret messages? There are many secrets on dollar bills— too many to list right here. But one includes a spider or owl hiding out near the upper left of the shield surrounding the “1” in the upper right of the dollar bill. Another secret is the meaning behind the Roman numerals MDCCLXXVI near the base of the pyramid. The numerals stand for 1776 — the year the Declaration of Independence was signed. #3 – Why is the pyramid on the dollar bill unfinished? It’s symbolic of our nation, which is also unfinished. Do You Know Where Your Dollar Bill Has Been? Have You Ever Tracked a Dollar Bill?